A team of Italian experts are going to propose their initial plan for the expansion and development of the National Museum of Iran in August. The main museum of Iran showcases 3,000 unique artifacts, but lacks sufficient space for its galleries. In line with the cultural relationships Rome enjoys with Tehran, the Italian Foreign Ministry has roll out a plan to develop the museum. Italy is committed to submit a detailed plan for the development by December 2005 and supervise a small part of the renovation including one historical era or one floor. It is hoped that the display capacity of the museum would increase from 2,200 to 6,000 ones. Now some 60 years old, the National Museum of Iran not only constitutes the country's largest archeological and historical museum, but also ranks among the large museums of the world in terms of the volume, diversity and quality of the artifacts in its custody. Considered the country's mother museum, it is aimed at preserving, researching, exhibiting and handing over past works of art to future generations, creating and strengthening mutual understanding between nations, identifying and presenting their contributions to universal culture and civilization, and enhancing the knowledge of the public, particularly schoolchildren, university students and researchers. 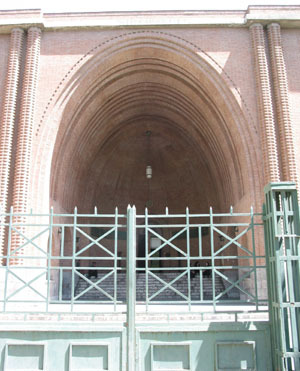 The museum comprises two buildings: the Iran Bastan Museum, established in 1937, and the Islamic Period Museum, established in 1996. Apparently, the creation of a museum was first suggested by the late Morteza-Qoli Hedayat entitled Sani' -od -Dowleh. His intention was to create a museum and office of antiquities in charge of regulating commercial excavations, but his efforts were unsuccessful. The first museum, named National Museum or Museum of Ma'aref , was created in 1916 in a large room in the Ministry of Ma'aref (Culture) located on the northern side of Dar-Ol-Fonun College. It possessed 270 artifacts, including bronze, terra cotta and glass items, coins, ancient weapons, seals, wooden objects, literary anthologies, manuscripts and textiles, collected by the personnel of the office of antiquities or donated by private individuals. In 1925, the objects preserved in this museum were transferred to the Mirror Hall of Mas'udiyeh palace. Also, with the beginning of archeological excavations by Europeans, particularly the French mission led by Jacques de Morgan, at Susa in 1897, the Iranians began to realize the importance of their country's cultural heritage. The unconditional monopoly of the French side was abrogated in 1927 and the French were only allowed to continue excavating at Susa. Also, since Iran had decided to create a national museum and library, the exclusivity of its design and execution was granted to the French. Thus, the French engineer Andre Godard traveled to Iran to carry out the project, officially beginning his work in 1929. As a museum should be designed in harmony with the theme of the objects in its custody and in connection with the history and arts of the country in which it is built, the facade and entrance portico of the museum were built in the style of the Arch of Chosroes, (some 35 meters high, 50 meters wide and 25 meters deep, the Arch of Chosroes is the famous palace of the Sassanid empire at Ctesiphon), using dark red bricks evocative of Sassanid architecture. The museum has a built area of approximately 11,000 square meters, its main building housing three floors. 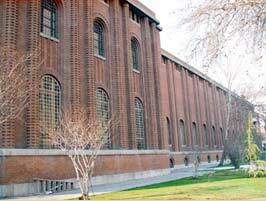 Begun in 1935 and completed within two years by Hajj Abbas-'Ali Me'mar and Ostad Morad Tabrizi, the museum building was officially inaugurated in 1937. The construction of the Museum of the Islamic Period, envisaged for various cultural activities, began in 1944 within the perimeter of the National Museum of Iran, and was eventually completed, after several interruptions, in 1950, but its finishing tasks were postponed to a later date. As a considerable collection of items preserved in this building are related to Islamic civilization and culture, it was decided that they should be exhibited in a new Museum of the Islamic Period. Hence, its design and interior decoration began in 1991, with due consideration for Islamic art and philosophy, although its plan follows the Sassanid cross. Totaling a built area of approximately 10,000 square meters on its four floors, this museum was eventually inaugurated in 1996. Two floors are dedicated to the exhibition of the museum's collections and the others are available for ancillary activities.